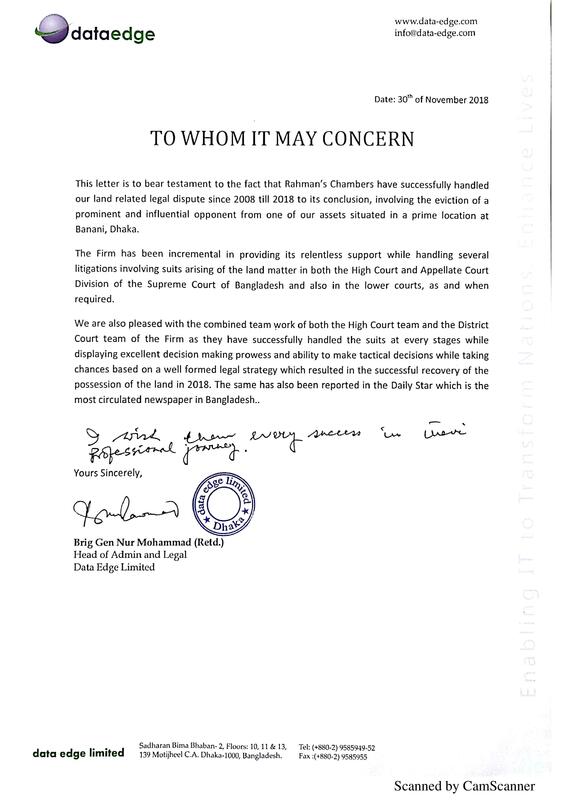 “Rahman’s Chambers have successfully handled our land related legal dispute since 2008 till 2018 to its conclusion, involving the eviction of a prominent and influential opponent from one of our assets situated in a prime location at Banani, Dhaka. For full recommendation click here. “Rahman’s Chambers provided excellent teamwork, questions were answered promptly, we received information and explanations about the local jurisdiction” which is quite different than its German equivalence. “.. .During 2012 – 2014, our firm has closely cooperated with Mr. Mohammed Forrukh Rahman of Rahman’s Chambers in Dhaka/Bangladesh. We represented a substantial German ship-owner, who had ordered four new buildings at a shipyard in Bangladesh. Unfortunately, all these four shipbuilding contracts failed and were ultimately canceled by our clients, which gave rise to very complex legal proceedings in Germany, England and Bangladesh. Mr. Rahman handled various proceedings in Bangladesh for our client against the local shipyard and its financing banks. He did so in a most effective, successful and cost-effective manner. We can therefore highly recommend the legal services of Mr. Rahman to any party, which needs legal support in Bangladesh in matters relating to international trade, financing and transport.“ For full recommendation click here. “From London, I have contacted Rahman Chambers in order to assist me in relation to a serious and complicated legal court case which was filed in the UK. The legal dispute was also linked to Bangladesh due to a number of issues in relation to the legality of a number of Bangladeshi documents that I have challenged not to be genuine. Mr Forrukh Rahman with his team of associates, have taken the challenge and played a vital role in this legal dispute by conducting a huge number of searches on my behalf in various governmental office in Dhaka in order to obtain legal evidence in support of my case that have then been submitted to the High Court in London. Mr. Rahman and his team have faced various challenges due to numerous deadlines and other difficulties working professionally in order to provide me with a great number of vital evidence which determined a positive outcome of my legal dispute recognized by the High Court judge in London.